[Below there will be spoilers and rambles. Read at your own risk]. THIS BOOK. Ohhhh, THIS BOOK. If I had the energy whilst reading it I would have chucked it clear across the room. I persevered looking for redemption and instead found nothing but an onslaught of narcissism. This is my second time reading WH, but my first time around hardly counts. Like many others, WH was required reading in my high school English class. It was sold as a tragic love story. More than likely, I read the cliff notes because I went through a period of academia where I wasn't, well, academic. The description of "tragic love story" however is one that has attached itself snugly onto Emily Bronte's only work. Surely that association is in part why this book is utterly despicable. "A brooding Yorkshire tale of a love that is stronger than death, it is also a fierce vision of metaphysical passion in which heaven and hell, nature and society, and dynamic and passive forces are powerfully juxtaposed. Unique, mystical, with a timeless appeal, it has become a classic of English literature." Totally misleading. Walking into WH one expects a love story, albeit a tragic one, but a love story nonetheless. Instead we are introduced to perhaps the most self-centered and codependent couple in the history of literature. Healthcliff, devastated and vengeful ends up marrying Linton's sister, Isabella. Catherine is more than a tad bit put off by this curve ball and Edgar fluffs up in manliness and there's fights between them all which causes Catherine to fall into a great depression, refusing to eat. Oh yeah, and evidently she's preggers and dies during childbirth. Interestingly enough, I had to reread the death by childbirth because I completely missed the fact that she WAS pregnant. I did some googling to see if I was the only moron who missed that one and thankfully I wasn't. As it turns out, back in the 1800's it was sorta taboo to discuss being pregnant, therefore it would be even MORE taboo to write about it. (This had something to do with the untimely deaths of women during childbirth). So, yeah, there were clues in the text, but it could easily have been misconstrued with Catherine's depression. Let's move it further along because Catherine is dead and now Heathcliff has a whole lifetime without her to make everyone around him miserable. Isabella escapes but not before SHE becomes pregnant. This is important because the Catherine's baby, also named Catherine and Isabella's baby, also named Linton, end up miserably married to each other later down the road thanks to Healthcliff's devious plan to make Edgar pay for taking Catherine away from him. Now if you thought that Catherine and Healthcliff were miserable individuals, reading the lives of little Cathy and little Linton will want to run to your doctor and get a prescription of Zoloft. If Heatlhcliff is the most vengeful character if literary history, then Linton is quite possibly the most pathetic. He is sniveling and sickly and weak. And sure dear ole' pops, Heathcliff preys on this and emotionally rips him to shreds daily but man alive, how he treats little Cathy in the end is disturbing and next to Catherine, one hated character. This book was like playing emotional russian roulette. You didn't know which character was going to make you want to jump off a cliff next. 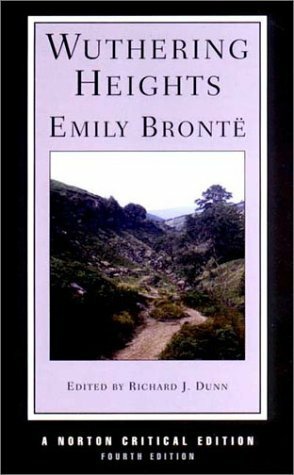 I haven't really read any creative license sequels, IE - books that use the characters from classics and tell a different perspective, but would love to find one where Wuthering Heights is told through the character of Hareton, Cahty's cousin and eventual second husband. He's an endearing character and ultimately is what makes Wuthering Heights a bit worthwhile. 18.1% "Oh my gawwwd Catherine is awful. What a self centered privileged cow." She ruined the novel for me. I had to take a Catherine break. Will be reunited again this evening.